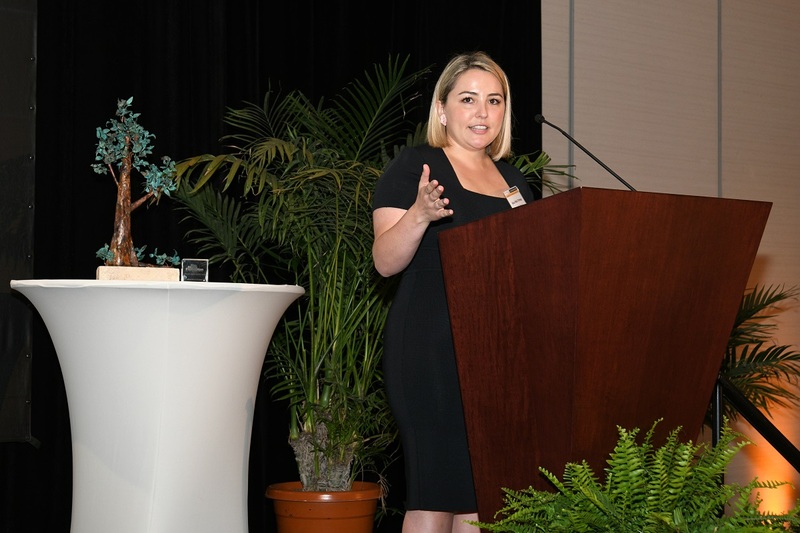 Editor’s Note: The Miami Foundation’s Emerging Philanthropist Award annually celebrates a 40-or-under donor who uses charitable giving to drive measurable results around a local cause, broadly improve the lives of Miamians and encourage others to give. The hope is that the award inspires other rising philanthropic leaders to see how any donor at any age can have a real impact on issues they care about. We’re pleased to announce Ana Mari Ortega as our inaugural honoree. Below are her remarks given at the Philanthropy Miami Donor Next Door luncheon where she accepted her award. Thank you so much. I mean it when I say that I am truly, truly humbled and honored to be here today. So, when The Miami Foundation initially called me to let me know I would be receiving this award and speaking in front of all of you today, I panicked. Let’s be honest, public speaking terrifies me. Then, they let me know that the other speaker today would be Dr. Carvalho, and then I really panicked, because he is, as many of you know, one of the best speakers in town. Thank you, Dr. Carvalho, for your commitment to Miami and our students. I’m sincerely looking forward to working with you when I become the board chair for City Year in July. And to The Miami Foundation, thank you for selecting me to receive this award. So a lot of people ask me where my passion for community service comes from and my parents had a lot to do with it. They taught me something which is so simple, and that’s empathy. And it wasn’t like they were saying “You need to practice empathy.” They taught it in the way they treated people, in the way that they interacted with people, in the way they spoke about people, in the way that they viewed the world in general. This idea that everyone has a different beginning and that you can’t judge someone or where they are in life because they haven’t had the same life experiences that you have had. And that has certainly informed the way that my siblings and I view the world and in the work I try to do every day. My parents too, gave us the gift of traveling around the world while growing up. When you travel to a lot of big cities globally, sometimes the juxtaposition between the haves and have nots is staggering. How many times have we heard the same story? You go to South Africa and see the townships or you go to Brazil and you have the favelas. The visuals can often be jarring for people. Then I realized…the juxtaposition between haves and have nots exists here too. Except, because of the way Miami is spread out geographically – because of how siloed each neighborhood is – it’s much easier, and more comfortable, to avoid. After having this internal dialogue with myself over and over again – I decided I was going to do something about it. I decided that if I was going to be a citizen and steward of this community then I was going to be a citizen and steward of this ENTIRE community – all neighborhoods included. Some of you may be wondering why I am wearing a red jacket in my photo and what it means. For those of you that don’t know what City Year is, let me give you a quick elevator pitch. City Year is an AmeriCorps program that brings together young people to give a year of service to a school in need. The idea being that national service should be a part of the American DNA. That’s where the name comes from. Ideally you’d have a junior year, a senior year and a City Year. So, City Year brings these young people together and partners with the school district to work in the highest need schools, focusing on the lowest performing students who are at risk of not graduating high school. They focus on their attendance, behavior and coursework, and in Miami have helped thousands of students reach a potential they didn’t know existed. Sometimes it takes just one person believing in you to make all the difference. All of our corps members wear these red jackets. The jacket is a symbol. A symbol of service, a symbol of safety, a symbol of mentorship. It symbolizes service to a cause greater than oneself. It symbolizes the concept of ubuntu – I am because you are. That our humanity is inextricably linked to one another’s. Looking around this room, I realize everyone here, through service, wears a red jacket in some form or another. When we feed the homeless, we wear a red jacket. When we mentor a young person, we wear a red jacket. When we work together to build a home, we wear a red jacket. When we offer kindness and compassion to a stranger – we wear a red jacket. There is an invisible thread, one of humble service to others, linking all of us here together. One of City Year’s many beautiful traditions is the red jacket dedication ceremony. Every year, before our corps members begin their work, they dedicate their red jackets to someone or something that inspires their service. It can be a parent, a teacher, a friend, a student. I’ve had the honor of being given a jacket and I’ve dedicated it several times. I always dedicate it to the same people. I dedicate it to the students that City Year does not serve. There is so much need in our community, and there are so many students who would benefit from having a City Year corps members in their life. So, when I talk about City Year nonstop, post all over Facebook, and I meet with people to tell them about what we do, when I try to raise money, it is always while thinking of these students that we do not serve, because until City Year is in every school in Miami-Dade County that needs us – serving every child desperately needing our services – my work with the organization is not over. So, I want you to think about those who inspire your service. Use them as your north star. The nonprofit sector is tough, the work is difficult and the challenges often seem insurmountable. So, keep the inspiration to your service close to your heart always. Miami gets a bad rap sometimes, but if everyone saw Miami as what I see in this room, they would be blown away. To stand here and have all of you honor me (?!) is surreal. I’m beyond overwhelmed. So in keeping with that beautiful City Year tradition, I want to dedicate this award to all of you who wear red jackets every single day, be they seen or unseen. I think if everyone in this world made it a point to wear that red jacket, it would be a much different place. Ana Mari Ortega, a Miami-based fashion designer and incoming board chair of City Year, is the 2018 Emerging Philanthropist Award honoree.